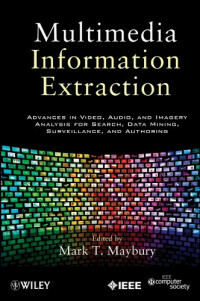 The advent of increasingly large consumer collections of audio(e.g., iTunes), imagery (e.g., Flickr), and video (e.g., YouTube)is driving a need not only for multimedia retrieval but alsoinformation extraction from and across media. Furthermore,industrial and government collections fuel requirements for stockmedia access, media preservation, broadcast news retrieval,identity management, and video surveillance. Whilesignificant advances have been made in language processing forinformation extraction from unstructured multilingual text andextraction of objects from imagery and video, these advances havebeen explored in largely independent research communities who haveaddressed extracting information from single media (e.g., text,imagery, audio). And yet users need to search for conceptsacross individual media, author multimedia artifacts, and performmultimedia analysis in many domains. This collection is intended to serve several purposes, includingreporting the current state of the art, stimulating novel research,and encouraging cross-fertilization of distinct researchdisciplines. The collection and integration of a common base ofintellectual material will provide an invaluable service from whichto teach a future generation of cross disciplinary media scientistsand engineers.